Transform your all-manual Leica M-mount lenses into fresh autofocus glass for your Sony mirrorless camera with the Leica M Mount Lens to Sony E-Mount Camera Autofocus Adapter from Techart PRO. Offering compatibility with the PDAF system on the a7 II and a7R II, this adapter has a mechanism to physically shift lens position up to 4.5mm on the Z axis, enabling autofocus even on manual focus lenses. 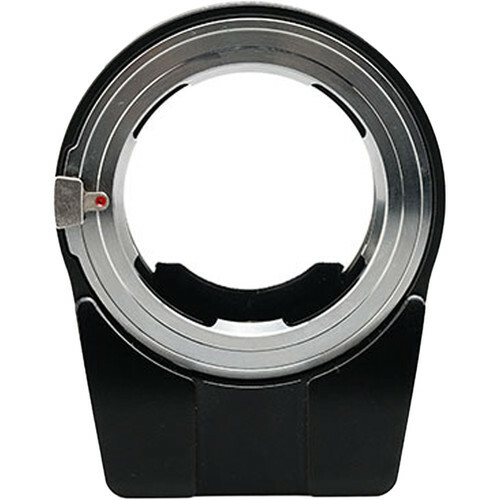 This adapter will support both AF-S and AF-C focusing modes and if the lens is set to its close-focus position, this adapter's extension can be used to get macro capabilities. For general use, it is recommended that the lens is set to its infinity focus position, enabling autofocus within its entire focusing range. Performance is optimal with 50mm lenses and wider, whereas telephoto optics will require coarse focusing with the lens before using the adapter for fine tuning via autofocus. In addition to adding autofocus, users can connect to the adapter via Bluetooth 4.0 and a mobile app in order to program lens data, up to 10 sets of which can be stored, and update the firmware. This allows for full EXIF data to be recorded when an image is taken and also enables complete compatibility with Sony's 5-axis in-body image stabilization. Additionally, it is designed to support lenses weighing up to 10.6 ounces. Box Dimensions (LxWxH) 4.8 x 3.4 x 1.5"
Leica M Mount Lens to Sony E-Mount Camera Autofocus Adapter is rated 3.9 out of 5 by 21. Rated 5 out of 5 by Shawn from Works on Sony A6500 Purchased to use of the Sony a6500. B&H phone sales seemed unsure of the adapters ability to work on the Sony a6500 but I purchased it anyway due to Techart's website saying that it was compatible with the a6300. So far, I've used my Leica 35 and Leica 50 lenses with the adapter on the a6500 and it worked very well. This device is very impressive. Don't expect it to be very fast, but it's probably just as fast as most people lining up their rangefinder focus. I have noticed that it will eat battery life, so I would suggest getting a second or third battery. Overall, very easy to recommend this cool piece of tech. Good luck! Rated 5 out of 5 by Steve from Innovation of the year! I couldnt understand why this is not named the most innovative photography gear of the year. Being able to convert a MF lens into AF is simply amazing. It gives me a completely new experience with my legacy lenses. You need to read through the information in order to properly use it and it does what it advertised! For the guy below, you need to park the aperture value of your camera at f/2 at all times for correct exposure and use your aperture ring to adjust the size of the iris. It has already been covered everywhere in the internet. Rated 5 out of 5 by Percival S. from Works better than expected. Using this with my voigtlander 15mm and my nikon AI-S lenses (24, 50, 85, and 105mm) all work very well with the adapter. I find that using AF-C works better than AF-S. Rated 5 out of 5 by Anonymous from Fantastic! Although not without faults, this thing has made my tiny camera bag (with a Sony A9) fit fast leica primes that autofocuses. I am now selling my heavy Nikon gear for good. Good: Lets you use ultra small 1.4 lenses that are sharp. Game changer Decent autofocus performance. You only have one lens on the camera at a time, so charing a single focus motor saves size and weight. Bad: My 90mm f/2 Leica glass is on the heavy side of the TechArt. You need to prefocus long lenses slightly. Rated 5 out of 5 by Anupun from Much better than expected. TechArt Pro adapter is a reverse-engineering product and it requires some settings on Sony camera body before using it. Too bad the TechArt company fail to provide these essential information on any instruction manual or on their web site. You have to follow these settings (for example, bit.ly/2FLMugQ or bit.ly/2MzwK1a) and learn to live with its quirks and perks (Remove battery and re-insert it to prevent battery drain. For rangefinder lenses, use only center focus-point. etc.). After correct settings on camera body, this adapter will honestly performs its task. Auto-focus is fast and reliable, much better than I had expected. Highly recommended. Rated 2 out of 5 by Anonymous from Techart Autofocus Has Mechanical Stability Problem I purchased this device and tried it out with a Sony A7R2 camera and 3 different Leica lenses. I noticed that one corner or sometimes two corners would be out of focus. I removed that black cover on the mechanism using a JIS screwdriver. The lens carrier, that moves, is driven by a rack and pinion geared to the motor, probably a stepping motor. The carrier rides on two linear bearings, a larger and a smaller one. These bearings are on one side of the carrier, meaning that the carrier is cantilevered and susceptible to flexing. Indeed I can see it move if I apply pressure to the lens. This means that parallelism between the lens focal plane and the sensor is dubious. Tipping the lens by even 1/1000 of an inch can cause a considerable change in focus. I think this is a poor design. The carrier should be positively supported at 3 or more points. A better approach would be a cam mechanism with at least 3 supports. The out of focus effect at the corner is worse the faster the lens. With a Leica Noctilux at f 0.95 the effect is worse, probably increased do to the weight of the heavy lens. I ran a series of tests with a Noctilux and a lighter APO 50mm Summicron, both 50mm lenses. With my particular unit the upper right corner of the image was usually blurry. The effect became small if I backed off to f5.6. However, there is no assurance that my sample is typical the units being shipped. Due to manufacturing tolerances some units could be much worse. It is a real shame that the mechanical design is dubious because the software seems quite reasonable and the focus is fast and accurate. Some people might find the device acceptable if they get a good unit and use fairly high F numbers. Rated 5 out of 5 by Anonymous from Tech art Pro Teriffic product. Auto focus with a Leica M lens added to the great manual focus on Sony A7 cameras is a dream come true. Expensive and it drains your battery even when the camera is off. Love it anyway. Does this work with the Sony A9? Yes, the Techart PRO Leica M Mount Lens to Sony E-Mount Camera Autofocus Adapter B&amp;H # TETALMEA7, would be compatible for use with the Sony Alpha a9 Mirrorless Digital Camera. Does this adapter work with Voigtlander lenses? Yes this adapter works with Voigtlander VM mount lenses. will it work with a sony FS7 or FS5? Yes, the Techart PRO Leica M Mount Lens to Sony E-Mount Camera Autofocus Adapter would allow you to connect Leica M-mount lenses onto the Sony PMW-FS5 and PMW-FS7 XDCAM Super 35 Camera. Yes. According to Techart's website, the Techart PRO Leica M Mount Lens to Sony E-Mount Camera Autofocus Adapter is compatible for use with the Sony Alpha a7 II, a7R II, a7 III, a7R III, a9, a6300, and a6500 Mirrorless Digital Cameras. Does it work with the sony a7S or not ?thanks. It hunts terribly on a7s. So the answer is no. Is this adapter compatible with L-brackets? I have the Sunwayfoto PSL-A7IINR for Sony A7-II and I suspect there might be an issue. The bracket should not stick out further than the camera body, so there shouldn't be any compatibility issue with a lens adapter. can it be use for the mitakon 50mm .95? This is for a lens with an M mount. Mitakon does not make any M mount lenses so this adapter will not fit. Will this work on the A6300? Also, will it support video AF? Yes, this adapter will work on the A6300 and will support video AF.